and organizations just like yours. Internet Marketing is really no longer a question of 'if you will design a web site' but when you will take advantage of what is quite possibly the most underutilized and arguably the most cost effective means of promoting your business. What Separates One Web Designer / Web Developer From Another? Unfortunately, qualities like professionalism, integrity and diligence are increasingly hard to find in the sea of web designers / web developers today. David Williams possesses those qualities but what separates him is his devotion to your success. We approach each web design project not from a 'getting the sale' mindset, but rather from a desire to develop long-term relationships where we strive to ensure the mutual success of both organizations. David Williams believes that your website should be an investment - not an expense. 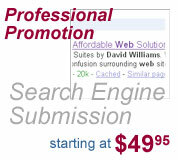 "Putting up a website for your business without professional Organic Search Engine Optimization and Search Engine Marketing is like buying a phone for your business but using an unlisted number"
David Williams can arrange everything needed for a successful internet marketing presence at a price you can afford! From the initial contact through the stages of Website Design & Development, Organic SEO -Search Engine Optimization, Publishing your web site and Search Engine Marketing & Promotion - we will work with you to ensure your 100% satisfaction with your web site. David Williams is a Freelance Web Designer and he is dedicated to giving his clients the same Professional Web Design services as larger web design and development firms without the large overhead expenses, therefore offering more affordable web design and web development solutions. Since we began designing and developing websites for fun in 1999 we recognized the need for our services so in 2003 we opened for business. Since then we still have fun but we have been driven by the goal of establishing relationships with our clients and producing the highest quality work. Remember, part of our core philosophy is that we believe your website should be an investment, not an expense. Through building relationships and celebrating ongoing client successes we have been able to reinforce this guiding philosophy and establish affordable web design and professional web development by David Williams. As the business continues to grow David Williams sometimes utilizes additional designers, scripting & database developers and other professionals known for their competence, professional standing and energy. They have been recruited on the basis of the quality and breadth of their experience. We call our affiliates “associates” because all who join our ranks take full ownership in building the best possible websites for you Our Clients making our collaborative efforts world-class. Our associates have strong internet marketing, scripting and design backgrounds. They bring industry specific experience to the table and they are ready to support your success as David Williams' clients. Simply complete the form as accurately as possible, save it, and return it to David Williams as an Email attachment. Click here to contact David Williams today and learn more about Affordable Web Design - Professional Web Development - Search Engine Optimization and Marketing for your organization. Even the the tallest tree in the field began with the planting of a small, simple, organic & natural seed. 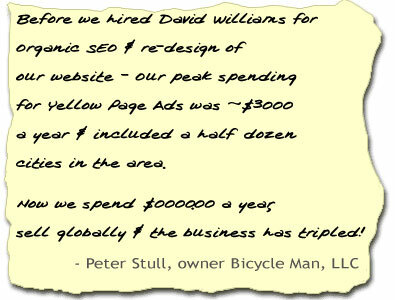 The same is true with a website ~ and the strongest sites in the field should be started with All Natural Organic SEO. And afterward build your house. Telling us that we must firmly establish our fields if we expect our house to prosper. I want to help you plant All Natural - Organic SEO seeds so that you may establish yourself in your fields and that your house may prosper. "Putting up a website for your business without professional Organic SEO and Marketing is like buying a phone for your business but using an unlisted number"
Located on Main Street in Almond, New York With clients in Alfred, NY | Hornell, NY | New York, NY and Western New York. Laus Deo ~ "Praise be to God!"